Over the past several months, I’ve been experimenting with acid-based toners. You know, the ones that can sting and remind you of the days when you used harsh astringents as a pepperoni-faced youth. Well, I’ve come to terms with the fact that, as a pepperoni-faced adult, I need acids in my life. Specifically, on my skin. And, even more specifically, some blend of glycolic, salicylic or lactic acids. These Power Glow Peel pads by M-61 Powerful Skincare have been keeping the hormonal acne on my neck and chin in check for the past six weeks. Oh, the power of exfoliation. Just imagine what it feels like to have zero major breakouts on your neck or chin for more than a month. Both my facialist and I were impressed at the lack of big bombs on my always-congested skin. Acids, y’all. They do not play around. While I still have annoying, deep-rooted blackheads in these trouble areas, it’s nothing compared to the typical cysts, angry red bumps and more that crop up every two weeks. I hope they’ve packed their bags for good and never come back! Compared to the other acid toners I have tried (Avanti RX, Rhonda Allison, Pixi and First Aid Beauty — reviews of the last three to come! 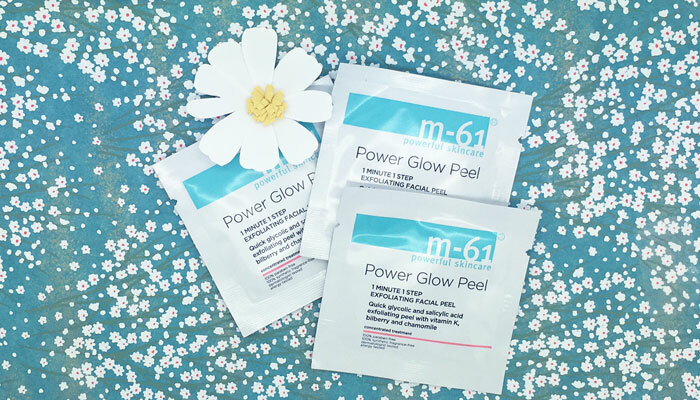 ), M-61’s Power Glow Peel pads were the strongest and most intense. Each individually wrapped towelette (it’s something like a 3-inch square) is soaked in a cocktail of glycolic acid, witch hazel, salicylic acid, peppermint and lavender to take on breakouts and deep clean pores, visibly reducing the appearance of pores and improving tone, texture and clarity. Because of this incredibly potent (and mostly clean) ingredients list, M-61 advises first-time acid users to try Power Glow Peel just three times a week before building up to daily use. My first week of using the pads sent my skin into exfoliation mode, stat, and I experienced a little bit of peeling during the process. I concentrated the pad on my chin and neck — my trouble areas — before moving it to my T-zone and then my cheeks. My cheeks did experience more of the dryness, as I’m not usually prone to breakout there and can have more combination skin in that area, so a word to the wise: Only use Power Glow Peel where you absolutely need it! You could probably even cut the pads in half to preserve them if you only need to use on the T-zone and neck. I now use the pads every other night, alternating with lower-concentration exfoliating toners on the days I’m not using Power Glow Peel, and have reaped the benefits: Non-clogged, radiant skin with minimal breakouts and a noticeable difference. Case in point: My boyfriend commented on how clear my skin has been looking (he, too, suffered from acne in his teens so understands my struggle). When someone else notices, you know it’s real! With results like this — and very fair pricing, at $28, $62 and $110 for 10, 30 and 60-day treatments packs — M-61 Powerful Skincare Power Glow Peel pads are an absolute must-have in my skincare arsenal and a wholehearted recommendation from me to anyone who is acne-prone and in need of major exfoliation. M-61 says Power Glow Peel pads are also wonderful for those with dull or dry skin who are concerned about wrinkles or hyperpigmentation. So, basically, if your skin is naturally flawless, then carry on. For the rest of us mere mortals, we have Power Glow Peel to keep us blemish-free and radiant. I’ll be repurchasing this, and you can find it on my faves page now, too! What acid toners are you trying? What ingredients help your skin through breakouts? Have you experimented with salicylic, glycolic or lactic acids? Tell me in the comments section!